I’ve found that using 3D modeling in CAD has a lot of advantages, but of course this is only my personal opinion. Everyone should choose the techniques that he feels the most adapted and simplicity can often be a question of habit. The important thing is to get the job done as best as possible using techniques that you feel comfortable with. OK, I see that you are talking about the 2 ways of drawing the ellipses. If you use a 3D CAD program as I describe in my eBook, then the face moulds and twist angles are generated automatically by the 3D model. I should clarify a little , the Plan is laid out the same way but the way of getting the face mould is listed as method “A” string and pin method and method “B” parallel lines to the plan . What 2 methods do you mean? once you can separate the two it becomes much easier to understand ! Personally I find it easier to draw the plan on a piece of paper. Jim is certainly on of the authorities on this technique and his name will appear regularly if you make a search on tangent handrailing. In fact surprisingly, for such an esoteric subject, there is quite a lot of useful information on the internet as well as books available on Amazon. So although it takes a bit of perseverance to understand the geometry once understood and practiced the actual drawing of the face moulds is straight forwards. The trickiest part is usually the carving and the moulding of the wreath. 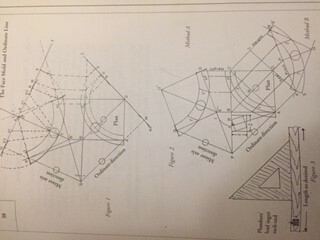 This is made more complicated from the geometrical section that is generated by the technique where the actual section perpendicular to the rake is truly not square. Today we prefer to make handrails using laminated sections, this builds a rail whose section perpendicular to the rake is square so moulding is much easier as well as the technique doesn’t require marking out at all. This makes making a wreathed rail faster and easier, but of course doesn’t give the craftsmen’s satisfaction of carving a real solid wood tangent rail. Good luck with your handrailing and don’t hesitate to post any questions if we can be of help. I’m currently working on a railing that requires an obtuse handrail. This is my first attempt at tangent railings. I have been studying several different books on the subject and have also studied the materials you offer. I am able to draw out the plan view, elevation, and what I’m hoping is the correct face mould! I have been using styrofoam to practice making blanks, but my progress is painfully slow. I have Stair Designer and Progecad, but my Cad experience is less than my tangent so I will be using them on future projects when I have learned a little more. Having said all that, do you have any recommendations on resources I can use to finish working through this railing?